Some liquid has just spilled into your Apple Mac. What should you do? Mac Repair Leeds recommends the following. Immediately shut down the Mac and unplug the power cord. Remove the Mac’s battery if it’s a portable Computer. Lay the Mac upside down on paper towels to get as much liquid as possible to drip out. Note what was spilled on your Mac. Bring the computer into Mac Repairs Leeds as soon as possible. Important! don’t try to turn it back on. Liquids can help electrical current move about the components of your Mac in destructive ways. Don’t shake the computer (this will only spread the liquid around). Don’t use a hair dryer on it (even at a low setting a hair dryer will damage sensitive components). What are the chances my Mac will be OK? The chances are surprisingly good. But keep in mind, most spill damaged Macs will require replacement parts. My Mac won’t turn on after a spill. Is it worth cleaning? If the Mac is fairly new it makes sense to attempt a spill cleaning. If it is older than three years, it may be time to consider a new Mac. How does this affect my warranty or AppleCare? Apple does not cover damage caused by spills. 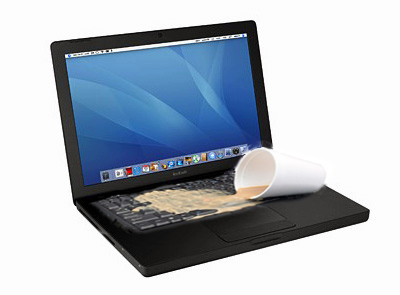 Apple charges pretty steep prices to deal with spill damaged Macs. Our prices are much more reasonable. Is there some type of warranty on spill cleaning? No, we offer a standard one-year warranty on the replaced parts unless otherwise specified at the time of the repair. We do not warranty the entire computer. It was just a little liquid. How could that have killed my Mac? It really depends on where the liquid made contact with the internal components. The tiniest amount of liquid could cause a logic board to fail. (The logic board is the main circuit board in your computer that connects to every part of the machine.) The logic board of a Mac is densely crowded with many sensitive components. I dropped my Mac off a week ago. What is taking so long? Spill cleaning is time consuming. It is a process that is best not rushed. Please keep in mind what is being done in the case of a spill cleaning. We must fully disassemble and clean your Mac. After that, it must be allowed to dry for at least 48 hours. Then we inspect it further to determine what if any damage has occurred. We replace suspect parts and reassemble it. Finally it is tested thoroughly to be sure it passes all functional tests. Can I trade-in my spill damaged Mac to you for parts? Usually not. Any parts damaged by the spill cannot be traded in but occasionally we may offer a small amount for other parts.